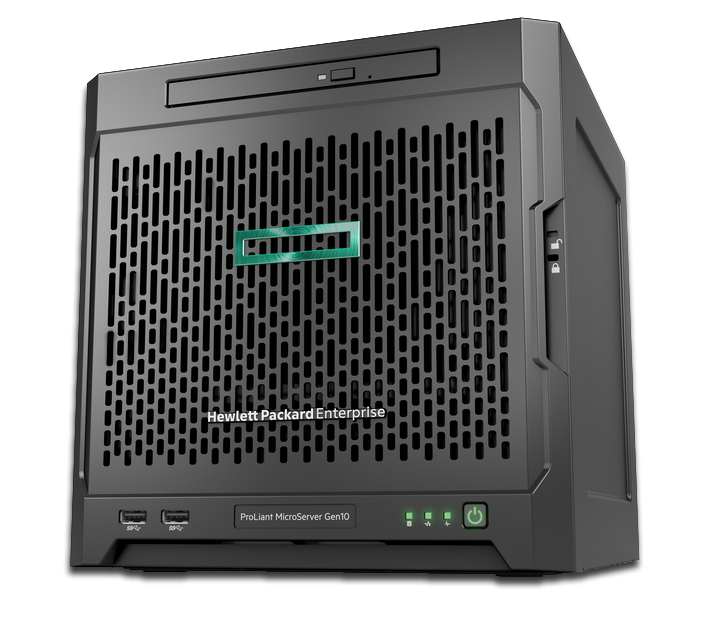 In the summer of 2017, HP released the Proliant Microserver Gen10. This machine replaces the older Gen8 model. For hobbyists, the Microserver always has been an interesting device for a custom home NAS build or as a router. Let's find out if this is still the case. In The Netherlands, the price of the entry-level model is similar to the Gen8: around €220 including taxes. The new AMD X3216 processor has slightly better single threaded performance as compared to the older G1610t in the Gen8. Overall, both devices seem to have similar CPU performance. The biggest difference is the TDP: 35 Watt for the Celeron vs 15 Watt for the AMD CPU. By default, it has 8 GB of unbuffered ECC memory, that's 4 GB more than the old model. Only one of the two memory slots is occupied, so you can double that amount just by adding another 8 GB stick. It seems that 32 GB is the maximum. This machine has retained the four 3.5" drive slots. There are no drive brackets anymore. Before inserting a hard drive, you need to remove a bunch of screws from the front of the chassis and put four of them in the mounting holes of each drive. These screws then guide the drive through grooves into the drive slot. This caddy-less design works perfectly and the drive is mounted rock-solid in it's position. To pop a drive out, you have to press the appropriate blue lever, which latches on to one of the front screws mounted on your drive and pulls it out of the slot. There are two on-board sata controllers. The Marvell controller is connected to the four drive bays. The AMD controller is probably connected to the fifth on-board SATA port. As with the Gen8, you need a floppy-power-connector-to-sata-power-connector cable if you want to use a SATA drive with the fifth onboard SATA port. Due to the internal SATA header or the USB2.0 header, you could decide to run the OS without redundancy and use all four drive bays for storage. As solid state drives tend to be very reliable, you may use a small SSD to keep the cost and power usage down and still retain reliability (although not the level of reliability RAID1 provides). As tested with iperf3 I get full 1 Gbit network performance. No problems here (tested on CentOS 7). This model has two half-height PCIe slots (1x and 8x in a 4x and 8x physical slot) which is an improvement over the single PCIe slot in the Gen8. The USB configuration is similar to the Gen8, with both USB2 and USB3 ports and one internal USB2 header on the motherboard. Sidenote: the onboard micro SD card slot as found in the Gen8 is not present in the Gen10. The Gen10 has also a GPU build-in but I have not looked into it as I have no use for it. The Gen10 differs in output options as compared to the Gen8: it supports one VGA and two displayport connections. Those displayport connectors could make the Gen10 an interesting DIY HTPC build, but I have not looked into it. The Gen10 has no support for iLO. So no remote management, unless you have an external KVM-over-IP solution. This is a downside, but for home users, this is probably not a big deal. My old Microserver N40L didn't have iLO and it never bothered me. And most of all: iLO is a small on-board mini-comuter that increases idle power consumption. So the lack of iLO support should mean better idle power consumption. Both Legacy and UEFI boot is supported. I have not tried UEFI booting. Booting from the 5th internal SATA header is supported and works fine (as opposed to the Gen8). For those who care: booting is a lot quicker as opposed to the Gen8, which took ages to get through the BIOS. I have updated this segment as I have used some incorrect information in the original article. The Gen10 seems to consume 14 Watt at idle, booted into Centos 7 without any disk drives attached (removed all drives after booting). This 14 Watt figure is reported by my external power meter. Adding a single old 7200 1 TB drive drives power usage up to 21 Watt (as expected). With four older 7200 RPM drives the entire system uses about 43 Watt according to the external power meter. As an experiment, I've put two old 60 GB 2.5" laptop drives in the first two slots, configured as RAID1. Then I added two 1 TB 7200 RPM drives to fill up the remaining slots. This resulted in a power usage of 32 Watt. Exactly the same as the Gen8, they stack perfectly. The Gen8 had a front door protecting the drive bays connected to the chassis with two hinges. HP has been cheap on the Gen10, so when you open the door, it basically falls off, there's no hinge. It's not a big issue, the overall build quality of the Gen10 is excellent. I have no objective measurements of noise levels, but the device seems almost silent to me. At first, I was a bit disappointed about the lack of iLO, but it turned out for the best. What makes the Gen10 so interesting is the idle power consumption. The lack of iLO support probably contributes to the improved idle power consumption. The Gen8 measures between 30 and 35 Watt idle power consumption, so the Gen10 does fare much better (~18 Watt). At this level of power consumption, the Gen10 could be a formidable router/firewall solution. The only real downside is it's size as compared to purpose-built firewalls/routers. The two network interfaces may provide sufficient network connectivity but if you need more ports and using VLANs is not enough, it's easy to add some extra ports. If an ancient N40L with a piss-poor Atom processor can handle a 500 Mbit internet connection, this device will have no problems with it, I'd presume. Once I've taken this device into production as a replacement for my existing router/firewall, I will share my experience. The Gen8 and Gen10 both have four SATA drive bays and a fifth internal SATA header. From this perspective, nothing has changed. The reduced idle power consumption could make the Gen10 an even more attractive option for a DIY home grown NAS. All things considered I think the Gen10 is a great device and I have not really encountered any downsides. If you have no problems putting a bit of effort into a DIY solution, the Gen10 is a great platform for a NAS or Router/Firewall, that can compete with most purpose-build devices. I may update this article as I gain more experience with this device.